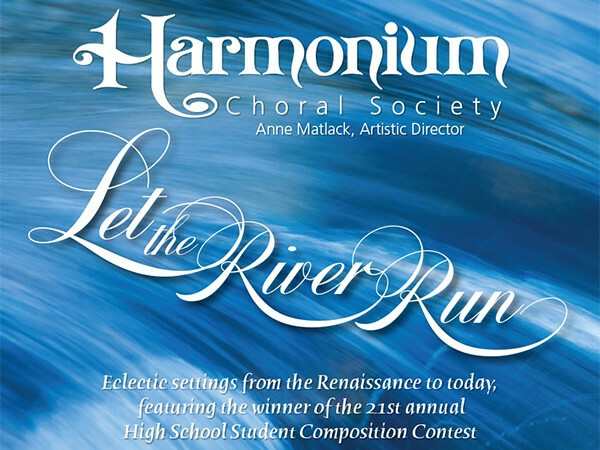 nj arts maven: Harmonium Choral Society Presents June Concert "Let the River Run"
Harmonium Choral Society Presents June Concert "Let the River Run"
WHERE: Grace Episcopal Church, 4 Madison Avenue at Kings Road, Madison, NJ. TICKETS: General admission tickets are $25 ($20 for students and seniors - age 65+). Tickets purchased by June 1st are $20 ($15 for students and seniors). Advance ticket reservations are recommended. Free parking is available behind the church. Please visit https://harmonium.yapsody.com/ to purchase concert tickets. For assistance or more information, email manager@harmonium.org or call 973-538-6969. Artistic Director Dr. Anne J. Matlack leads the acclaimed 100-voice choral society in a concert featuring the Carly Simon song of the same name, as well as eclectic settings from the Renaissance to today. The program includes world music from Russia to Cuba, and composers ranging from Palestrina to Copland to Whitacre. As in past years, the June concert will also feature the winner of Harmonium’s Annual High School Composition Contest. This year’s first-place winner, Reshma Kopparapu (left), is a 12th grade student at Newark Academy in Livingston, New Jersey who plays piano, oboe and violin. Previously, her compositions earned second place in the 2015 and 2017 Harmonium Choral Society Composition Contest. Harmonium will also perform the second-place composition by Carl Hausman (below, left), a senior at Mount Olive High School who is an accomplished cellist and member of the robotics team. In addition, several other student composers will be honored: third prize winner CJW Van Der Wende, a junior from Oak Ridge, and honorable mentions David MacMillan, a senior at Vernon Township High School; Justin Witwick, a senior at Cranford High School; and Henry Marinovic, a freshman at Madison High School. Harmonium Choral Society, based in Morris County, is one of New Jersey's leading choral arts organizations. The 100-voice choral society has been recognized for its musical excellence and innovative programming, and has commissioned and premiered works by Amanda Harberg, Matthew Harris, Elliot Z. Levine, Harmonium's composers-in-residence Mark Miller and Martin Sedek, and others. Directed by Dr. Anne J. Matlack of Madison, Harmonium’s season consists of four subscription concerts held in December, March, April, and June, as well as numerous special events and partnerships. Harmonium, known for its eclectic programming, choral excellence, and community spirit, sponsors commissions and musicianship workshops, as well as an Outreach Chorus that performs in schools, nursing homes, and other venues. Harmonium sponsors an annual High School Student Choral Composition Contest, which celebrated its 20th anniversary in the 2016-17 season. This innovative program won the prestigious Chorus America Education and Outreach Award. Harmonium has toured internationally to England and Wales, Eastern Europe, Northern Italy, Spain and Portugal, and Greece and Turkey, and most recently traveled to the Baltics in the summer of 2016. To learn more about Harmonium, please visit Harmonium.org. Fake news ripped from the headlines! NJ FESTIVAL ORCHESTRA’S SEASON FINALE BECKONS!